Water properties as close to nature are the key for every aquarium's success. However, monitoring relevant parameters in seawater is difficult due to numerous interfering ions. Therefore, test kits considering the specific characteristics of seawater are needed to analyze the water precisely. It’s great on the low end, but after 12 it’s complete garbage. Colors aren’t even close. I really like how simple this kit is to read. Much simpler than trying to match color to a card without a reference, I really prefer comparing the two vials. My girlfriend is color blind and even she can tell where the colors match up with this kit. Purchased this kit because of others reviews and I also confirm: the dual color chart and vial holder works incredibly well. I am "color confused" sometimes as my grandfather was color blind. I feel 100% confident that I can differentiate and trust my findings. Priced right for what you get. I'm very happy with it. Like many of us, Inused another test kit that only showed that my nitrates were under 5ppm. I desired a more accurate reading and found that with this kit. The kit is simple and relatively quick to use. The colors are easier for me to discern than others. One bit of advice when using this kit for the first time: The cuvette holding the tank water WITHOUT reagents is the one you place on the colored mat. I read the instructions and missed this and thought I had a faulty kit, but after re-reading them, I realized my mistake. I echo most other comments about the Nyos Nitrate test. This is easier to use and the dual vial test helps to make for better interpretation of the results. This will be my go-to test kit going forward. 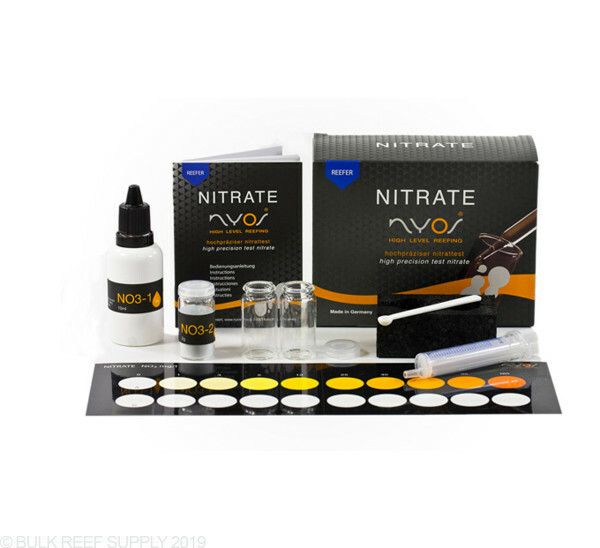 Over the years I have tried several nitrate test kits, including API and Red Sea. Based upon the BRS recommendation and user reviews, I switched to the NYOS test over a year ago. (I'm about to start on my third kit.) It is easy to use, and the color scale is by far the easiest to interpret. Until something better comes along, this is my nitrate test kit. Easy to use and easy to read. Best I have used so far. 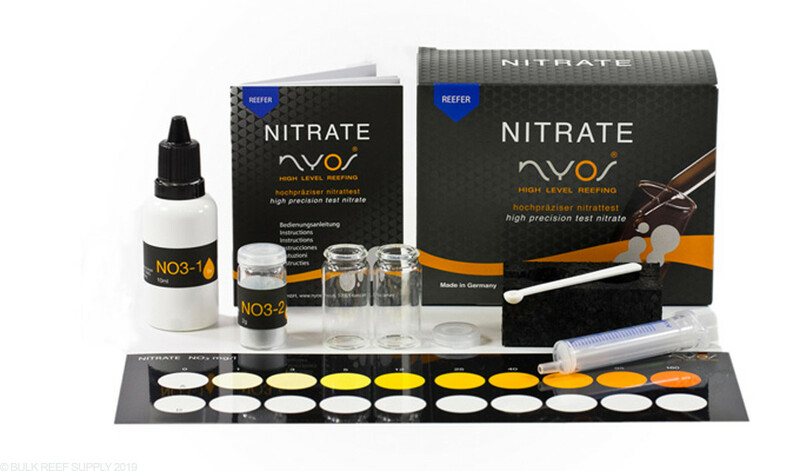 I've used many test kits on the market and for the past few years I've been using the Red Sea Nitrate Pro. It works well but results are slow and interpreting the color differences is difficult to say the least. Recent trends in reef keeping have SPS tanks chasing 1-5ppm these days so I figured why bother with the low range confusion. This kit reads 0-1-3-5ppm and so on. I still read 0ppm with this test but the ability to distinguish 1-5ppm has me confident to does up to 1-3ppm. I purchased this based on the BRS video on test kits. I really wanted to know my NO3 readings. So upon getting the kit I tested almost daily. Readings were always low (3-5ppm) and consistently. . I was happy b/c NO3 were stable. After awhile the reagents ran out so I recently ordered another one. I immediately noticed the reagent powder in the new kit looked different. Its really white (more like expected) while the reagent powder in the kit purchased in March was tan/brown. My N03 tests using the new kit are now completely different. NO3 is way higher (12-15) and kinda what I expected. I did parallel tests with the old reagent powder and still low (3-5ppm). So the reagent powder seemed to be bad in the first kit. And I used it to get incorrect readings and guidance for months! Very disappointing since you have to put so much trust into these kits and I bought it based on BRS endorsement. I still like the kit and will do a new review after using the new powder. Just check the powder and make sure it looks white. I really like this test kit. It's easy to use, far more accurate than some other brands. Another reviewer mentioned the warning about caps. The lid for your test vial is the same lid as for the regent. If you're not careful, you might put a damp lid on the regent and ruin your kit. So watch out for out, but I'm definitely buying another one when the time comes. This kit was super easy to use. It was really accurate and helped me recognize the issues I had in my tank. It was a great purchase. Are there refills available for sale or do I need to purchase a entire kit when I run out? Great question! Unfortunately we do not carry refill kits for the Nyos test kits, however, some of our other brands of test kits do have refills available. Does this kit work for freshwater? This kit is for saltwater use only.